Goldie is another one of our veteran rescue dogs who has been with us since the initial startup of our company. Originally the personal pet of one of our venture capitalists, Goldie seemed to have a strong desire to hang around once our facilities were complete. 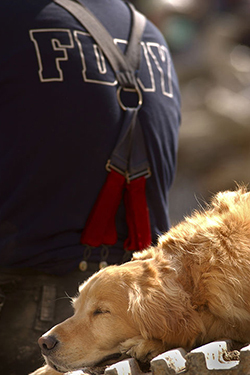 Goldie was one of several dogs flown to New York on that dreadful day in 2001 when America was attacked and the twin towers fell.